Our Moroccan Tile stencil design is another star in our growing tile stencil design collection. Inspired by Geometric Moroccan patterns of the past that are so popular today. Our Moroccan tile stencils are fabulous on walls, back splashes and of course for floors, where they resemble popular cement floor tiles. Our tile designs are super easy to use and provide a big savings to more costly alternatives of wallpaper and floor tiles. Get a Pinterest-worthy tile floor for a fraction of the price of real tile! This stencil is available in 2 sizes: 12"x12" & 24"x24". Note that this stencil is designed to be used as a continuous floor pattern and might not fit precisely into your existing 12" or 24" tiles. Stencil features an easy registration system, just use parts of the previously painted design to align the stencil and continue. This gives you a seamless "wallpaper" look. Don't worry about super perfect alignment: in the end your eye will never ever notice the discrepancy. Which stencil paint to use? You can stencil with acrylic or latex paint, stencil creams, glaze, etc. It's best to have your walls painted in flat latex paint as it makes a perfect base coat for stenciling. For stenciling on tile floors, use Stix adhesive primer as your base coat, tinted to the color of your choice and then stencil with latex or acrylics as usual. Protect your stenciled floor tile with a coat or two of acrylic polyurethane.We do not recommend oil paint or spray paint for stenciling. Use a dense foam roller or stencil brush. If you want nice crisp edges, using spray adhesive may be very helpful (Elmer's seems to be the best) to ensure minimal bleed. Want to learn how to stencil a seamless stencil pattern? 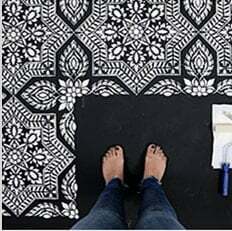 Here are the detailed illustrated step-by-step Allover Stenciling Tips.